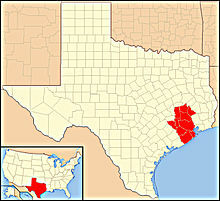 The Roman Catholic Archdiocese of Galveston–Houston (Latin: Archidioecesis Galvestoniensis–Houstoniensis) encompasses 8,880 square miles (23,000 km2) of ten counties in the southeastern area of Texas: Galveston, Harris, Austin, Brazoria, Fort Bend, Grimes, Montgomery, San Jacinto, Walker and Waller. The chancery of the archdiocese is located in Downtown Houston. The archdiocese's first cathedral church is St. Mary Cathedral Basilica in Galveston, with a co-cathedral, the Co-Cathedral of the Sacred Heart, located in Downtown Houston. The co-cathedral is used for all major archdiocesan liturgies. The archdiocesan history began with the erection of the prefecture apostolic of Texas in 1839, thus making Galveston the "Mother Church of Texas". The prefecture was elevated to a vicariate apostolic on July 10, 1841. 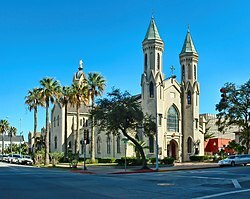 On May 4, 1847, the vicariate became the Diocese of Galveston in the Province of New Orleans and St. Mary Cathedral Basilica was designated the cathedral. In 1926, the then-diocese was placed in the newly created Province of San Antonio. After the devastating Galveston Hurricane of 1900, Houston began to expand after the Port of Houston was completed. At the request of Wendelin J. Nold, fifth bishop of Galveston, Pope John XXIII authorised the construction of a co-cathedral of convenience in Houston, and on July 25, 1959, the name of the diocese was changed to the Diocese of Galveston–Houston. Sacred Heart, a parish church located in downtown Houston, was named the co-cathedral of the diocese. This change made Houston an episcopal see city, and permitted full episcopal ceremonies to be held in both Galveston and Houston. In 1979, Pope John Paul II recognized the importance the diocese's cathedral played in the development of Texas and the western United States and elevated the status of St. Mary Cathedral by naming it a minor basilica. By the end of the 20th century, the diocese had become one of the largest in the United States with its episcopal see cities becoming internationally important. Recognizing this, in December 2004, Pope John Paul II created the new Ecclesiastical Province of Galveston–Houston and elevated the See of Galveston–Houston to a metropolitan see. Bishop Joseph Fiorenza, who had led the diocese for 20 years, became the first Archbishop of Galveston–Houston, and Bishop Daniel DiNardo became Coadjutor Archbishop. The Archdiocese of Galveston–Houston oversees the following suffragan dioceses: Austin, Beaumont, Brownsville, Corpus Christi, Tyler and Victoria in Texas. Many landmark structures are contained within the archdiocese. Most prominent is St. Mary Cathedral Basilica, the mother church of Texas, and one of the few buildings and the only church to survive the 1900 Galveston Storm. Other landmarks include the 1887 Bishop's Palace, the former 1912 Sacred Heart Co-Cathedral, and Annunciation Church, one of the oldest churches in Texas. The coat of arms of the Archdiocese of Galveston–Houston is composed of a blue fielded shield on which is displayed a scattering of silver and white roses and topped with a bishop's mitre. The roses represent the Blessed Virgin Mary, in her title of the Mystical Rose, titular of the Cathedral-Basilica in the see city of Galveston. The red cross represents the Faith, with a square center containing a single silver star to represent Texas, the Lone Star State. Approximately 1.7 million Catholics live within the boundaries of the Archdiocese of Galveston–Houston (equaling 26% of the total population), making the archdiocese the largest in the state of Texas and the fifth largest in the United States. The archdiocese's 146 parishes are served by approximately 435 priests (193 diocesan, 195 religious, and 47 other) and 411 permanent deacons. As of 2018, the Catholic school network of the archdiocese is the largest private school network in the State of Texas. As of that year the archdiocese had 59 schools, with about 19,500 students enrolled. ^ "Archdiocese of Galveston-Houston". Catholic Hierarchy. 13 June 2015. ^ a b c "Statistics". Archdiocese of Galveston-Houston. 2014. Retrieved July 1, 2011. ^ a b c "History". Archdiocese of Galveston-Houston. Archived from the original on 2012-04-15. Retrieved 2016-03-23. ^ a b Vara, Richard; Dooley, Tara (March 29, 2008). "St. Mary Cathedral Basilica is the cradle of Texas' Catholicism". Houston Chronicle. Retrieved 2016-03-23. ^ "History". Annunciation Catholic Church. Retrieved 2016-03-22. ^ "Coat of Arms". Archdiocese of Galveston-Houston. Retrieved 2016-03-23. Wikisource has the text of a 1913 Catholic Encyclopedia article about The Diocese of Galveston. Wikimedia Commons has media related to Roman Catholic Archdiocese of Galveston-Houston.